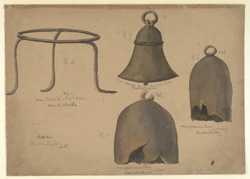 Watercolour by Philip Meadows Taylor (1808-1876) of metal objects from Narkailpalli (Nalgonda district), Andola (Gulbarga district) and Hyderabad cairn circle graves, dated 1851. The objects include two copper and one bronze bell, and an iron tripod. The image is inscribed on the front in ink: 'Fig 1 Iron Tripod. Natl size. Cairn A. Andola. Fig. 2. Cast Bronze Bell. Natural size. Hyderabad Cairns. Fig. 3. Wrought Copper Bell. Natl Size. Hyderabad Cairns. Fig. 4. Wrought Copper Bell. Natl. Size. Narkailpullee'; also with other notes. All of these objects are reproduced in Taylor's 'Descriptions of Cairns, Cromlechs, Kistvaens and other Celtic, Druidical or Scythian monuments in the Dekhan' (Dublin, 1865). Figures 1,2 and 3 are reproduced on the same page at half their original size. Taylor wrote, "In one cairn [near the city of Hyderabad] a bell, with a tongue attached to it [fig. 2 in the drawing]...was found - it had been cast, and was of good finish, the metal being still resonant - with a good many urns, red and black - some iron links of a chain, spear and arrow heads much decayed and another bell of wrought copper [fig. 3 in the drawing]...In two instances here [at Narkailpalli], also bells were found...Three of those found were sent by me to the Museum of the Asiatic Society of Bombay, where they now are. Of these the most perfect...is of wrought copper, and was evidently used as a cattle neck bell" [fig. 4 in the drawing].